Hard water dries out skin and makes hair brittle. 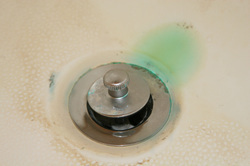 It causes soap scum in tubs and showers and spots on faucets, fixtures and dishes. It also causes scaling in water-use appliances and water heaters, which results in a reduction of efficiency, costly repairs, high operation costs and premature replacement. Soaps and detergents do not lather well in hard water which leads to using more than necessary. Often additional personal care products are used due to the drying effects of the water on hair and skin. Homeowners waste money and time on specialty cleaning products and chores. Although hardness does not pose a health risk, it can certainly be a nuisance and can cause many unnecessary expenses. Click here for a free consultation about your water. pH is a measure of the relative acidity of the water. 7 is neutral; below 7 is acidic. 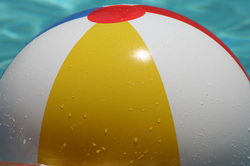 When the pH is low, the water is described as acidic. Acidic water can leach metals out of the plumbing system, causing plumbing, staining and taste problems. 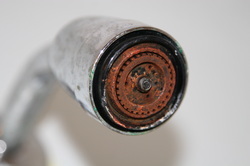 Dissolved copper will be left behind in showers and sinks, leading to a blue-green stain after the water evaporates, and weakening the plumbing system over time. Lead and copper can dissolve into the water leading to a metallic taste to the water, and causing the water to flunk the health related parameters for lead and copper content. Acidic water also reduces the life of water using appliances. Click here for a free consultation about your water. High levels of iron and manganese can cause discolored water as well as stains on clothing, appliances, hair and fixtures. Although iron is more common, they are often found together. Iron deposits can build up in pressure tanks, water heaters, filters and plumbing which can result in reduced water pressure, reduced efficiency and costly repairs. What's more, these metals can cause water to have a metallic taste and odor. Recommended treatment methods vary depending on contaminant level and its chemical form. On site testing is required to properly specify a system. Click here for a free consultation about your water. 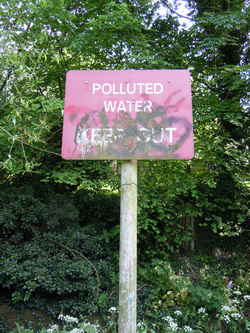 Another common source of smelly water is hydrogen sulfide. Hydrogen sulfide is a colorless corrosive gas that has the characteristic odor of rotten eggs. It is most commonly found in groundwater supplies and often is noticed coming from hot water tanks. 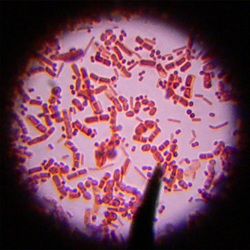 It can occur naturally from deep in the ground or can be produced by sulfate-reducing bacteria. It can affect the taste of food and beverages, making them unpalatable. If present in high enough concentrations, it can leave an unpleasant odor on hair and clothing. 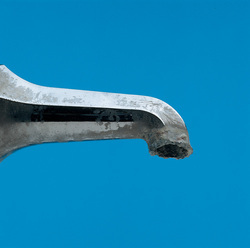 It can also accelerate corrosion of metal parts in appliances. Because it is a gas, testing for it usually has to be performed onsite. Click here for a free consultation about your water. Since the 1850s, chlorine has been used as a disinfectant to kill harmful bacteria in water itself or the pipes that transport it. It has helped end a number of major threats to public health. Although chlorine in water is essential at the treatment plant and in the water distribution system, it is no longer necessary once the water reaches your home. Though chlorine is vital for stopping the spread of disease, its benefits come at a price. Chlorine tastes and smells bad. It dries skin and hair, fades clothes (bleach is made of chlorine) and can dry out the rubber seals in water-use appliances, shortening their lives. Click here for a free consultation about your water. According to the Centers for Disease Control and Prevention, there could be as many as 12 million cases of waterborne acute gastrointestinal illness annually in the United States alone. These illnesses are frequently caused by bacteria, viruses and protozoa that make their way into the water supply. And unfortunately, these contaminants can survive in the environment for months. Even well operated, state-of-the-art treatment plants cannot ensure that drinking water is entirely free of microbial pathogens. System failures do occur, and not all systems are functioning at the levels they should. And bottled water, which is unregulated and varies considerably, may not offer any more safeguards against pathogens than tap water. Click here for a free consultation about your water. Don't see exactly what you're looking for? Contact us to ask in-depth questions pertaining to your water concern. Click here for a free consultation about your water.